President of Industry for Schneider Electric Spain. It is vital for businesses to occupy spaces before the rest get there. Josu Ugarte is a Spanish leading expert in internationalization and multi-location of businesses. During his career that has spanned more than twenty years, the author of “España está en crisis, el mundo no” (Spain is in Crisis, Not the World) has spent twelve years as an expatriate. He is currently Schneider Electric’s Vice-president of Industry for Spain and was President of Mondragon International from 2008 to 2015. As a speaker, Josu Ugarte offers a comprehensive outlook on two concepts: the fragmentation of the value chain and the development of advanced services. He is a professional with first-hand knowledge of managing multi-ethnic teams, cultural diversity and emerging markets. He has taken part in many events for all kinds of audiences, from banking institutions to professional associations. Ugarte blends an accessible and entertaining style with the depth and breadth of his knowledge, which not only covers day-to- day management in the new globalized environment, but also his experience in innovation and his global brand vision. He has become an expert in emerging market nation models, in particular those of the BRIC countries (Brazil, Russia, India and China), where under his management the Mondragón group increased its sales by 86% in four years. Ugarte is a member of the Spain-China Foundation, the Spain-Russia Foundation, the Exporter’s Club and the Executive Committee of the Chamber of Commerce of Guipúzcoa (in the Basque Country). He has published articles on globalization, SMEs, emerging markets and possible ways out of the crisis in Spain in several specialized media. His first foray into writing books was España está en crisis. 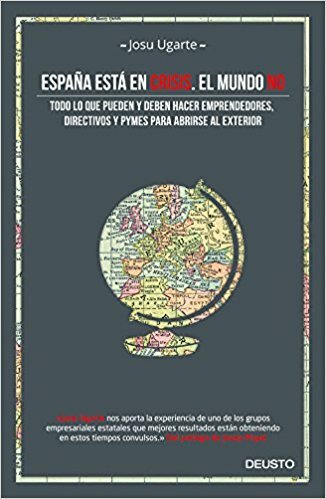 El mundo no, (Spain is in Crisis, Not the World) in which he offers advice and solutions for tackling a tough economic situation through internationalizing business activities. Josu Ugarte Arregui nos habla de internacionalización. Entrevista a Josu Ugarte Arregui donde nos habla de claves para la internacionalización de las empresas españolas. España está en crisis. El mundo no. Founder and CEO of Performance Insights. Professor of Management and Strategy. Expert on Globalization.